Sefukuji Temple (施福寺) is one of 33 temples of Kansai located in Izumi, Osaka Prefecture. It was established in early 6th century. It enshrines the sacred Mirokubosatsu, Maitreya. The main hall is constructed in 1860. It is located on the top of Mt. Makio that is 491m tall. Therefore, you have to climb up the hundreds of steps. 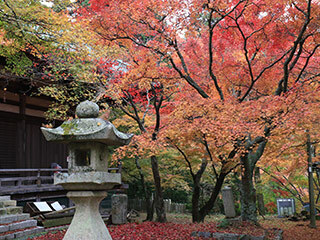 Sefukuji is also famous for Autumn leaves. There are about 200 Japanese Maple Trees in this temple. 0. at Izumi Chuo Station. 1. use local bus to Makionochugakkou. Change to Orenge bus to Makionoyama. 2. walk about 1km long to the top of the mountain. Sefukuji Temple is Tendai Buddhism Temple located on the top of Mt. Makio, Izumi city, Osaka Prefecture. It was established in the time of the Emperor Kimei. The record of the temple said, priest Kukai practiced in this temple in 793. It's been a practice place for Shugendo. The main scripts of this temple are Kannon Statues.